Posted on August 5, 2015 by Matt Frazier / This entry was posted in Product Reviews. Bookmark the permalink. Da Vinci vaporizer is one of the most highly recommended vapes we sell here at our little New York City smoke shop Sunflower Glass Company. Owner Erik Pye uses one personally and enjoys it very much and often recommends it to our customers because it is durable, has long battery life and can be used for either dry herbs or concentrate. There are many qualities about the Da Vinci Ascent that make it a great product. The Da Vinci vaporizer is a very durable piece of technology. Its solid heavy design means it can take some wear and tear associated with carrying the product around and continued uses. 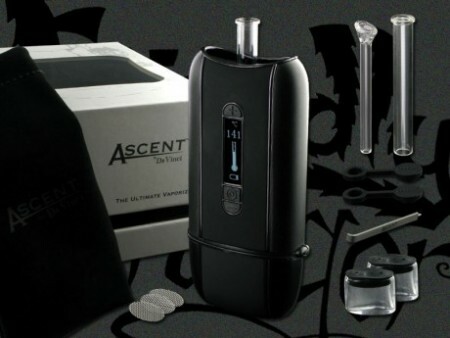 The Da Vinci vaporizer features a ceramic heating chamber for an even vape it also employs a glass on glass screen and airway that can be extended from the back of the device giving the steam more time to cool. The glass on glass screen and airway can be easily removed and soaked in alcohol for easy cleaning and continued use, it is also easy and cheap to replace if it is ever broken. Sometimes people consider the Ascent to be a bit bulky but the trade off is long battery life, the Ascent battery life is about 2.5 hours, this is twice as long as some of it’s competitors. The temperature control for the Da Vinci is on point literally it can be set to the exact degree of temp you prefer to vape in and the thermostat displays in either fahrenheit or Celsius. The Ascent is powerful and can go from 38 to 430 degrees F in 45-90 seconds. One of the best feature of the Ascent is you don’t have to clean it that often. With the Pax for instance after a few uses the mouth piece gets gunked up and the device wont power up properly without lubing or cleaning the device. With the Da Vinci Ascent you get lots of uses without having to stop and clean the device. This makes this Da Vinci vaporizer more of work horse your going to use all of the time. To get the most out of the Ascent the user should pull quite slow and steady. Though some may see this as a con at first, in the long run it is well worth it because you are getting more vape out of less material and better quality vapor. The Da Vinci vaporizer is super versatile a lot of people buy it for use with dry herbs but it can also be used oils, and concentrates by utilizing the concentrate chamber accessory included with every Ascent . First Step- Turn the Da Vinci Ascent on. Located at the top of the vaporizer is a power button. Press the power button on and wait for the OLED screen to pop up. It will show you the baseline temperature reading. Make sure it is fully charged first! Second Step- Using the temperature toggle choose your desired heat level. Starting off at around 380 degrees is recommended and then adjusting based on preference and material being used..
Fourth Step- Lock the herb chamber back in place. Press the heat button and wait for the temperature to reach your desired degree. After that number is hit let it sit for about 10 seconds and then proceed to pull from the glass tube mouth piece. Fifth and final step- Now it is time to empty and clean the ascent. First power off the device. Open the herb chamber and remove as much used material as you can using the cleaning tools provided.